I can't believe Easter is only few days away and I seriously cannot wait! Easter has always been a special event for me, not in the religious way but for me its more like the representation of my family getting together, like many other families, and having a nice and fun time all together and in my opinion it is just the best thing in the world. Also Easter means first of all we are having not one but two bank holidays, I mean... Hello There! Secondly my boyfriend and I are going away from London and get a well rested break in the countryside and thirdly we are going to be able to eat & drink our weight in chocolate, tea, home made cakes & breads you name it! Basically having a food coma for four days but it will be worth it! What about you? Tell me all about your upcoming Easter break plan, I would love to hear them. 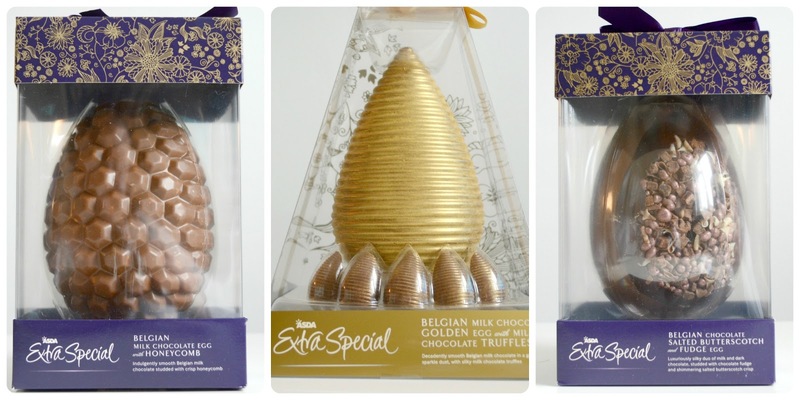 For today's post, once again, I teamed up with ASDA and when they asked me if I was up to receiving a couple of their Extra Special deluxe Easter chocolate eggs, I seriously could not say no. I mean who who would say no to chocolate, seriously who? So it is with delight that the next day I got the most exciting delivery from ASDA ever! They sent not one, neither two but 3 giant size Easter eggs. I was literally jumping for joy as I was handed the bag. So what did they send me? Well, lets start with the most 'out there' one, which I think looks just fantastic and different of all the Easter egg I've seen already out there. It's the Belgian Milk Chocolate GOLDEN Egg with Milk Chocolate Truffles. It is a mouth full I know but I do believe that golden Egg will wow the person you'll offer this beauty to. It's almost too pretty to open but having said that, there is truffle in the recipe so in my opinion it won't stay unopened for long. 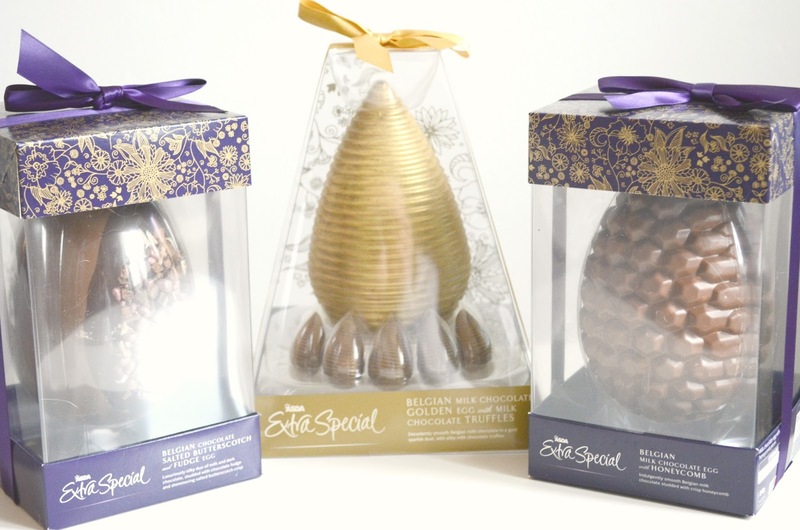 My second favourite has got to be the Belgian Chocolate Salted Butterscotch and Fudge Egg. I love Salted Butterscotch and it is mixed with chocolate and also fudge!! This must be the mix made in heaven! Also I love all the crunchy bits located in the centre of the egg and i can't wait to bite into them as I've got the feeling I might cheekily keep that one for my Easter treat! (Shush don't tell anyone!). Last but not least is the also: 'sounds mega delicious too' the Belgian Milk Chocolate Egg with Honeycomb. It is also such a pretty egg and I actually find the honeycomb shape very cute. I am also tempted to keep that one for myself but then that would be really greedy. Do you like the mix of honeycomb and chocolate as much as I do? What is not to like, crunchy honey and milk chocolate...my mouth is watering already! So which one is your favourite? Tell me all by commenting below. *This post contains PR samples. This does not affect my opinion of the products.